In a large baking tray, toss the squash with olive oil, salt, and pepper and roast at gas 7 for about 20 mins. Cook the cous cous according to the packet instructions. Make the dressing by mixing the ingredients together in a small bowl or cup. 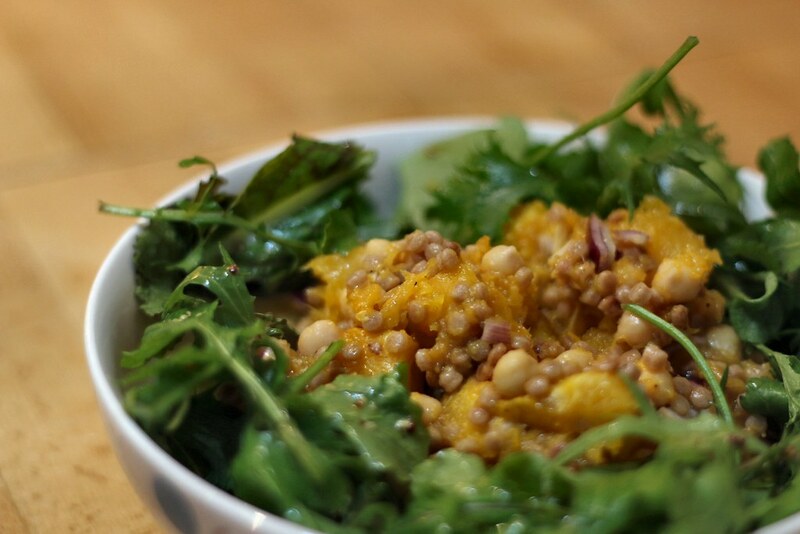 In a large bowl, mix together the cooked cous cous, roasted squash, onion, and chickpeas. Arrange the warm ingredients and salad leaves onto plates and drizzle with dressing. Serve immediately. The salad ingredients will keep in the fridge for a few days, but keep the leaves, cooked ingredients, and dressing separate until you're ready to eat.